Ed Ruscha, one of the most influential artists working today, and one of the great West Coast Pop artists, didn't start out as a painter. It was under the influence of teachers including Robert Irwin, Richards Ruben and Emerson Woelffer that he gave up his original goal of becoming a commercial artist to focus on fine art. This third volume in the ongoing documentation of his entire corpus of paintings captures him in his stride. As throughout the series, each painting, reproduced in color, is given a double-page spread with exhibition and bibliographic history. The artist's sketches for paintings are reproduced in facsimile. 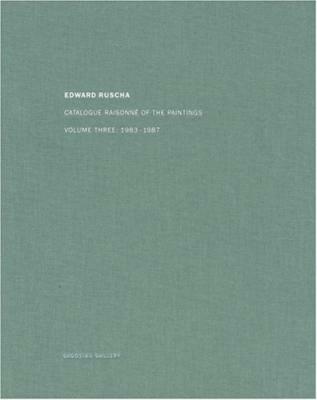 This volume contains 165 works, and, of particular note, includes a major public commission for the Philip Johnson-designed Miami-Dade Public Library, which was a turning point for Ruscha. Paintings done immediately prior to this commission can be seen as a summation of the artist's earlier preoccupations and techniques, while those done after the commission show a major shift in direction occasioned by the use of airbrush techniques to produce dark, atmospheric canvases with links to film noir and to such Los Angeles noir writers as Raymond Chandler. With an introductory essay by Robert Dean, a personal tribute by artist Lawrence Weiner, a chronology and a comprehensive bibliography and list of exhibitions.